Sign up for our Connect newsletter to receive tips and important updates right in your mailbox. Hentsū is a technology startup providing services to asset management and hedge fund clients. The firm focuses on applying technology solutions to the asset management industry. Hentsū has built a transcontinental office portal with Gruveo, and we've asked the firm’s Marketing Manager, Christine Johnson, to tell us more about it. 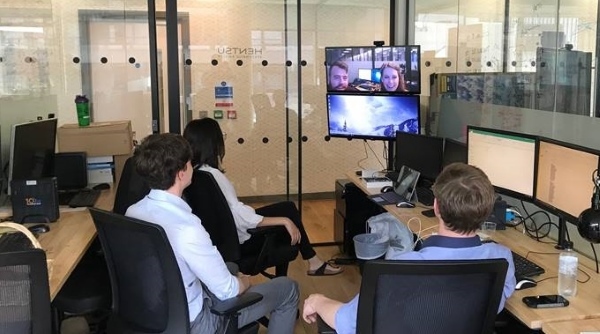 Christine explained that it all began when Hentsū expanded to two offices in different countries and felt the need to connect the London and New York locations. After searching and trying out various other platforms, they decided to use Gruveo. “We love it, it's been a great tool," says Christine. She continues: "Being located in New York, I love being connected to London all the time and being able to just reach over and talk to them." Gruveo video calls made the Hentsu office portal possible. The first thing Christine does in the morning is dial into ​the portal in one of the conference rooms. Hentsū has an ongoing Gruveo video call in there, all day long, until the London office leaves. "It's part of our everyday connection with the other team. But we also use Gruveo for one-on-one calls. We have a few handles set up between the New York and London offices and we've been leveraging them for our team communication," explains Christine. Since they started using Gruveo, the team's morale has improved significantly and the cooperation of the teams has never been better. She says that Hentsū is very happy with the call quality, too, and the teams don’t experience system interruptions, even though their calls are all-day-long. ​Gruveo doesn’t disconnect them, and they appreciate being able to rely on it throughout the day. We hope you have been inspired by the creative way in which Hentsū is using Gruveo! If you'd like to explore what Gruveo can do for your business, sign up for a free Pro subscription trial. It's better to see it once than hear about it one hundred times! Don't forget to share this case study with your colleagues. The buttons are at the top!